The Matriarch is a Tactical Entry in the Boromite Army List, and a potent leader - whether taken as an addition to your existing Mining Guild, or as the centerpiece for a new army project! The primary goal of a Boromite clan is to work and amass collective wealth, and to this end they seek employment doing all the dangerous, difficult, physically and psychologically demanding jobs that are beyond the capabilities of ordinary humans. It is the Guild Mothers who determine whether a contract is acceptable, as well as other decisions such as if their clan needs to move on or divide, or whether transgressors should be punished and how. Although in theory the Rock Fathers take precedence over the clan’s Guild Mother during times of war, in practice it would be a very courageous Rock Father who acted against her wishes. The matriarchs expect their menfolk to advise them and take control of fighting forces on their behalf, but not to defy them! 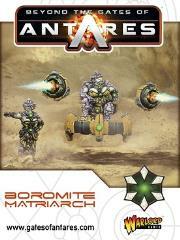 The Boromite Matriarch box set contains the Matriarch herself, sat atop a Suspensor Platform - one Guildess, and two Weapon Drones - each armed with a plasma carbine. All models are metal.